New Paper Illustrates Another Failure Of The IPCC Mullti-Decadal Global Model Predictions – “On the Warming In The Tropical Upper Troposphere: Models Versus Observations” By Fu Et Al 2011 | Climate Science: Roger Pielke Sr. Even though their paper failed to cite already published peer-reviewed papers that show the problem is even more serious than they report (e.g. 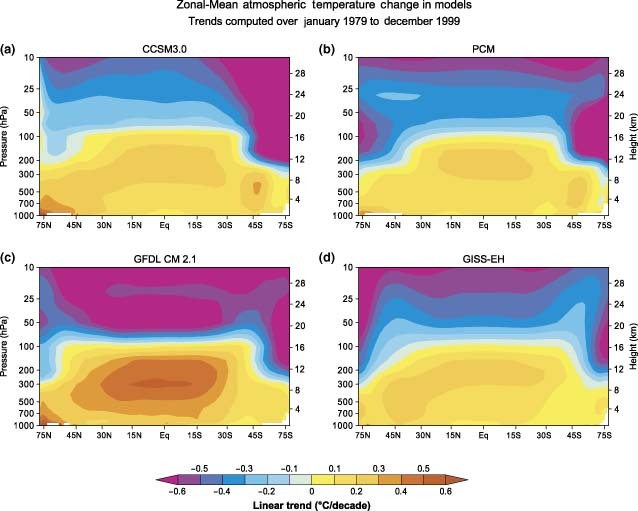 including that both RSS and NOAA have spurious warming in the 1990s), their new paper is still quite critical of the skill of the IPCC model predictions of upper tropospheric tropical warming. In contrast to the Thorne et al 2010 study, there is a fundamental disagreement between the model predictions and the real world observations. This new Fu et al 2011 paper, despite ignoring peer-reviewed papers that show the discrepancy is even larger, is still another “confession” regarding the failure of the IPCC to accurately simulate the climate system.